Just remember the wonderful times, when The banks used to give an interest of 12% and more on an FD, There was no TDS and no mandatory PAN linkage, no taxes to be paid and the corpus was doubling in every five to six years. On top of that, petrol was in single digits, the only snack you could eat was a Samosa, luxury car was a Maruti 800 or max a Maruti 1000, Levi’s Jeans were the fashion statement, Festivals meant the Annual purchase of new clothes and shoes, binging was on Peter Scot whisky in summers and Old Monk in winters, eating out was at a Dhaba, summer holidays meant a sojourn in Mussoorie or Simla, winters were for visit to Grandparents, and for weekends we used to go for a picnic. The Club Tambola was the ultimate entertainment, The latest blockbuster movies could be watched in “air-cooled” cinema halls @ Rs 3 per ticket, Chitrahaar and Sunday Movie on DD was looked forward to, and sports were played in the neighborhood park. Alas, The later half of the 90’s and the new millennium changed all that. The first decade brought in the wonders of the mobile phones, the Internet, multiple Tv channels, latest brands and gizmos, alternative entertainment and holiday options, the QSR’s and chain restaurants, glitzy malls, The single malts, wine and cheese pairings, Jazz evenings, weekend getaways to beach resorts, summer cruises, the SUV’s and countless avenues to splurge apart from petrol close to hitting the triple digit mark. Suddenly, we had moved away from, “On what do I do with my earnings, there are no spending avenues, Let me just save or buy an asset,” to a different league of credit card debt and EMI’s for household gadgets and mobile phones. The days of a movie, Cola & samosa, all in a princely sum of Rs 5 were long over. Computerisation, Digitisation, PAN and AADHAR in the current decade ensured greater tax compliance and alas, no more savings from tax evasion. Who could have planned for all this? A double whammy, of an increase in expense due to abundant availability of luxuries converted to “necessities”, and reduction in income due to taxes. That is how life is, full of glorious uncertainties and disruptions. for a Rs 100 haircut which used to cost Rs 25 when you had hair. And most investors assume a nominal inflation and decrease in cost of living over time during your financial planning for retirement, or children’s education or marriage etc. Education costs have multiplied by more than 100 times in the last 20 years, apart from the expense on tuitions & coaching classes which are the norm now. Marriage expenses, especially North Indian Weddings have gone on to another level and the multiple increases in the expense is becoming increasingly difficult to ascertain. Some people understand compound interest, but most do not appreciate the “de-compounding” effect of inflation on their money. As general prices rise, the purchasing power of the consumer decreases. What compound interest gives, inflation takes away. Put it another way - inflation is effectively the reverse of Compound Interest; Since each year's inflation occurs on top of the previous year's inflation, it means that the effect is just like that of compound interest and your expenses will also multiply exponentially. Inflation eats away at your savings, bit by bit. We all know this, but even so, we fail to incorporate this knowledge into our savings and investment decisions, as illustrated by the graphic below. A simple 7% inflation will reduce our corpus to half in 10 years and similarly, due to 7% inflation, our current expenses will double every 10 years. A safer 6% inflation will shrink a Rs 1 crore corpus to 54 lakh after 10 years, 29 lakh after 20 years, and 16 lakh after 30 years. This 6% or 7% inflation is the government sponsored WPI or CPI or at the most food inflation. Healthcare, education, cost and standard of living, marriage costs etc are expected to shoot at 12-15% besides changes in the spending pattern over time. 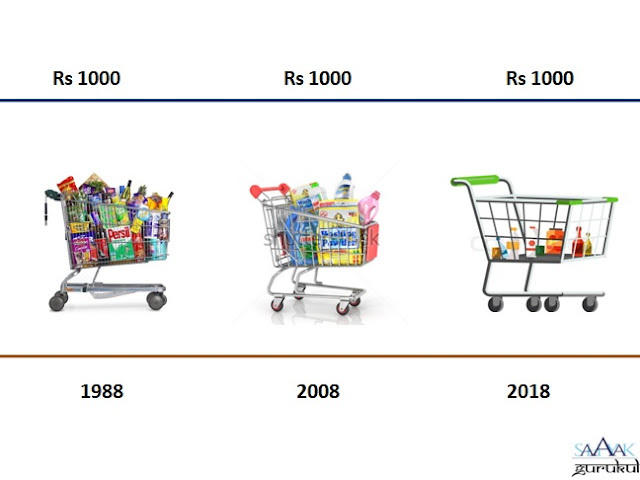 Even with a Rs 1 crore retirement corpus, A 10% increase in spending every year and your corpus earning a 7.5% return, will erode your corpus completely in 13 years and suddenly you may find yourself helpless @ 73 years. Another giant killer of the targeted corpus is Tax. In addition to profits from selling investments, you'll pay tax on any interest, dividends, or rental or other income you receive. 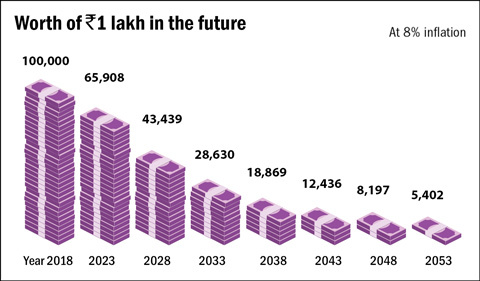 The compounding impact, over the long term, will be quite substantial as outlined in the above case. 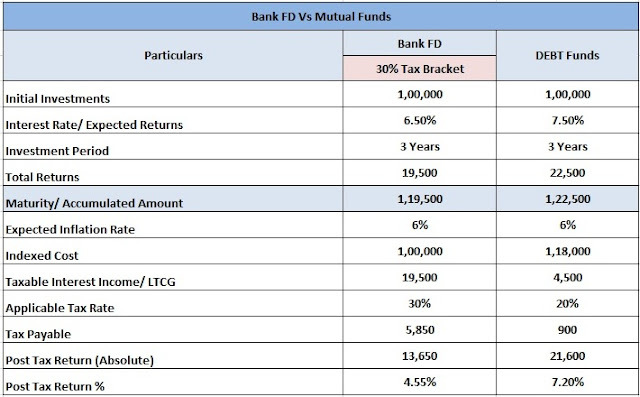 The recent introduction of a 10% tax on LTCG (long Term Capital gains) in the last budget means your investment plans have to increase either the investment amount by 10% or the expected return by 10% to achieve the desired goal. Hence the first guiding principle of any financial planning has to be that your target for Post Tax investment return should beat the projected practical inflation estimatesand not the Government sponsored figures of low single digit inflation, or you will end up compromising on your child’s education or be left to the same old dependence on your children for a “comfortable” retirement. A better return can be obtained not only after a higher risk but also better tax planning and intelligent investing. It is better to err on the side of caution while setting the target, and aiming to save a little more than the anticipated value.